Intermedia Unite Overview | Core Technologies, Inc.
A fully integrated business communications and collaboration platform that combines a phone system, video, screen sharing and file management into a seamless experience. 99.999% financially-backed uptime SLA and automatic rerouting of calls in event of any outages. Unite scales according to the needs of your business. Order service according to the number of users; no guessing number of lines needed. Intermedia Unite automatically rings all your endpoints with every call and in the event that you don’t answer, it routes the call to any number you choose (branch office, automated attendant, mobile number, etc.). Unified Communications as a Service (UCaaS) is an interconnected system of communication and collaboration applications and services that are hosted in the cloud. UCaaS combines features such as video conferencing, telephone communications, video conferencing, and file backup and sharing into one platform. Intermedia Unite is a new easy-to-use cloud-based unified communications (UC) platform that helps employees to be more productive and collaborative with a full-featured phone system combined with audio/video/content sharing, conferencing, and file sharing and backup capabilities. Desktop VoIP phones to span the spectrum of all your employees’ needs. 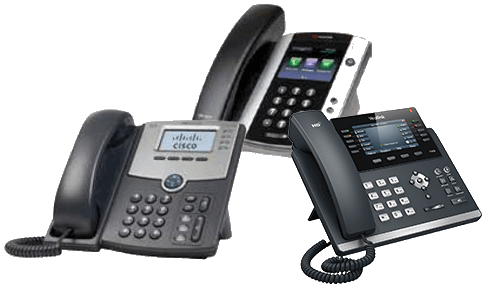 We’ve identified a range of Polycom, Cisco, and Yealink phones to span the spectrum of your business needs. No technical installation required, just connect them to the internet and they’re ready to go.